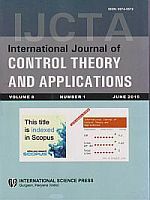 The International Journal of Control Theory and Applications is a peer-reviewed journal. The object of this journal is to publish original full length research papers in the area of System, Engineering, and Mathematics. Topics include: Artificial Intelligence, Analytical Mathematical Methods, Neural Networks, Fuzzy Theory, Numerical Methods, Robust Control, Engineering and Practical Applications concerned with the above mathematical approaches.